Some times I feel like I spend all day feeding everyone but myself. Between meeting the needs of a preschooler and a toddler, and nursing a constantly hungry newborn, I'm finding less and less time to cook. Add to that the fact that I'm not working this month (unpaid maternity leave) and both Brad and I are trying to start losing the baby weight, ordering in or going out is not really a good option either. 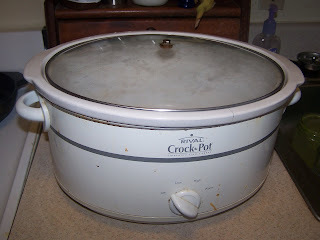 Let me introduce you to one of my favorite kitchen appliances: my Crock Pot. My crock pot is not glamorous. It is not new. It has definitely seen better days, and the lid used to have a handle. This is not due to lack of respect or a history of abuse. No, my crock pot is just showing wear much the same way my 4 year old's beloved teddy bear is starting to look a little ragged around the edges. But a few trips through the washing machine have done little to lessen the attachment of my son to his bear, and the lack of a lid handle simply lends character to my hard working crock pot. When the baby is crying and the kids are screaming and the cat has puked on the carpet again, it's a comforting thought that dinner is cooking away with little to no effort on my part and when Brad gets home from work all that needs done is to dish it up. I also make my crock pot work double duty by cooking up large batches of dinners at a time and either freezing for a no-brainer dinner later, or keeping in the fridge for easy lunches and snacks. 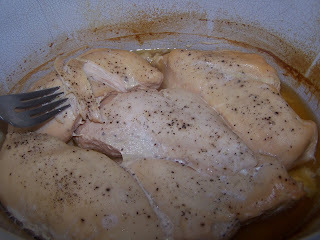 Today I started with about a 5 lb package of boneless skinless chicken breast. I only buy these when they go on sale for less than $1.99/lb. Otherwise I get whole chickens to roast and make broth. 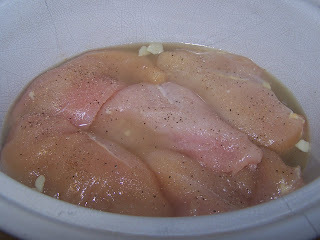 I trimmed all of the fat from the whole package of chicken, placed them in the crock pot and generously seasoned with salt and pepper. Some times I use a little poultry seasoning or rubbed thyme, but mostly I keep it simple since I'll be using this chicken in all sorts of different recipes. I add about an inch of broth to the crock pot so it doesn't dry out, and set it on high for about 4 hours. If you need it to cook longer, you can set it on low for 6-8 hours, and it should be done when you get home from work. 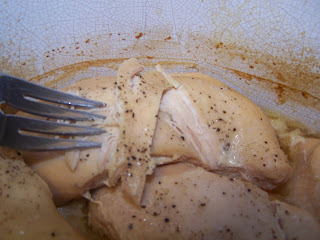 Fall apart tender, fork shreddable, juicy, tasty chicken! This chicken now has the possibility to become: soup, burritos, stir fry, sandwiches, salad, lunches for Brad to take to work, cashew chicken, quesadillas, just about anything. Being already cooked, it makes dinner come together in a matter of minutes. Which is some times all the time I have between marathon nursing sessions that the baby likes to start right around 4:00 and continue up until bedtime. Hey, at least she sleeps at night! I am a work-at-home mom to two wonderful little boys. Since becoming a mother and quiting my job to raise my children, I have longed for the homestead life. 5 acres with horses, chickens, maybe a cow, a garden, and a home. Since that dream is still years down the road, I’m doing my best to institute the principals of living with the earth into the reality of my urban townhouse. I'm trying to raise my family to be conscious of the environment and the impact that our every day choices have on the health of our planet. Although I long ago replaced most disposable products in our home with reusable ones (diapers, paper towels, napkins, etc.) I had never found a suitable alternative for the sandwich baggie. Since I pack a lunch for my husband every day, and for me and the kids when ever we'll be out of the house over the lunch hour, I found myself going through a lot of plastic baggies, and I knew there had to be a better way. Thus was born: the WallabyBag. Until my husband graduates with his PhD, my homestead is in my heart.